Flux Factory is pleased to present a two-person exhibition of returning Artists-in-Residence, Cecilia Enberg and Christina Helena Romirer. 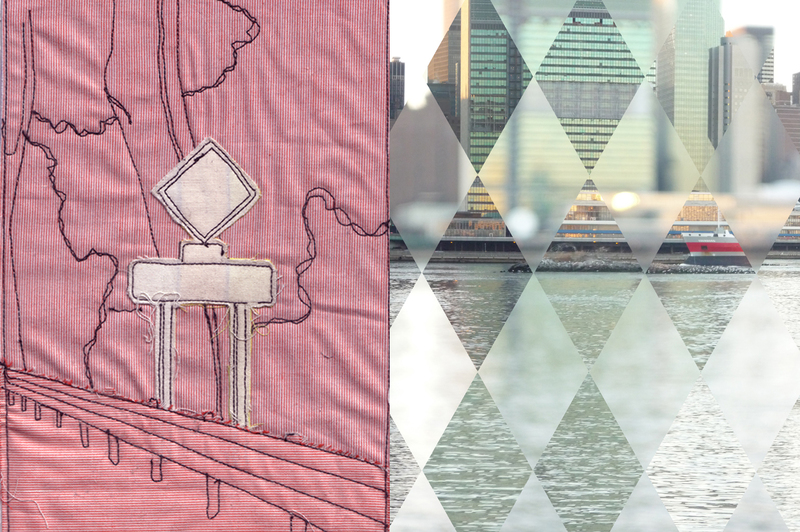 In My Imagination, I Was Already Here focuses on the city, its patterns, and grids. The exhibition title refers to a quote from Jean Baudrillard’s America: “I was here in my imagination long before I actually came here.” A phenomenon that is especially connected to New York City, we explore the scene precisely before setting it. New York is so much more than Manhattan. It is more that its buildings and bridges, of which we all have prefabricated images. Even if we’ve never visited, we have a sense of the city from photographs, postcards, and movies. New York is the transit system, flashing lights, dust, hidden street corners, signs, crowds, changing neighborhoods, and stories heard while wandering. The city operates in so many layers. What shapes a city, a place, or a neighborhood? What can be defined as a landmark? How do people chose their daily commutes? Cecilia Enberg’s and Christina Helena Romirer’s works focus on answering these questions, discovering and exploring the hidden places of the metropolis. They will show their own views, impressions, and investigations of the city through drawing maps and developing patterns. About the artists: Cecilia Enberg and Christina Helena Romirer met in January 2011, when they both arrived in New York City to participate in Flux Factory’s Artist-in-Residence program. Cecilia Enberg is an artist based in Stockholm, Sweden. She holds a B.Sc in Multimedia and is a member of KKV Nacka, an artist-run workshop in Stockholm. Enberg is interested in the junction between new technology and traditional craftsmanship and works in various media, such as printmaking, needlework, and photography. Christina Helena Romirer in an artist and scenographer based in Austria. Her work often deals with spaces and ambiences that enlace small details not obviously shown at the first glance. She works in media such as space installation, photography, large scale prints, and sculpture. This exhibition is made possible, in part, with the support of the Swedish Arts Grants Committee. During her stay at Flux Factory, Eva Ursprung is collecting similarities between Graz and the areas surrounding Flux Factory in Queens. In her video- and sound environment, she will highlight the similar/different faces of post- and co-industrial lifeworlds in Graz and Queens. New episodes posted: August 12th, September 9th, September 29th American Alien, a project developed by Flux Factory Artist-in-Residence Ye Taik, is designed to increase awareness of the Burmese diaspora and to serve as a platform for the Burmese American voice. Through interviews published as podcasts on the Flux Factory website, American Alien will address topics related to Burmese innovation and hybridity.